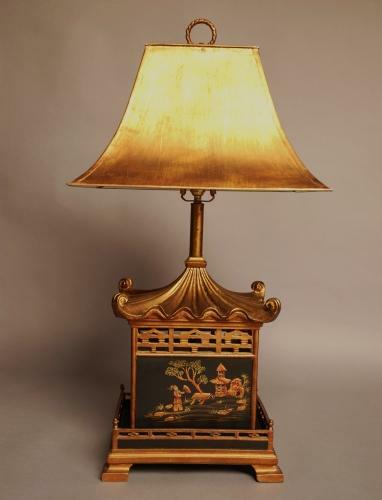 A highly decorative Chinoiserie style table lamp. The lamp shade is metal with a gold leaf finish with a white enamel lining. The base is in the style of a ribbed pagoda again with a gilt finish. There are four lacquered Chinoiserie panels, with pierced sections at the top, the panels of various Oriental scenes. This lamp is in working order but if purchased would need to be checked by a qualified electrician before use.